Try our Advanced Edition risk-free for 14 days. No credit card required. *Prices based on an annual contract. We also offer monthly plans. 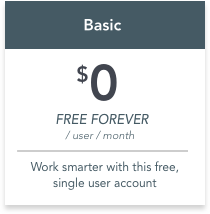 ** Subscriptions to third-party services not included. May require a one time setup fee. The Team plan is $18 / user / month billed monthly, or $15 / user / month billed annually. The Advanced plan is $30 / user / month billed monthly, or $25 / user / month billed annually. The Premier plan is $60 / user / month billed monthly, or $50 / user / month billed annually. The Enterprise plan is $120 / user / month billed monthly, or $99 / user / month month if billed monthly.